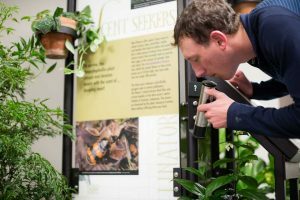 The North Carolina Arboretum Exhibitions program creates world-class traveling exhibits that help further the Arboretum’s mission of connecting people with plants. Designed by teams of horticultural and curatorial experts with the passion to engage and inspire, the Arboretum’s traveling exhibits, blend science, culture and natural history to create dynamic experiences for all ages and interests. The North Carolina Arboretum is proud to introduce its newest traveling exhibit, Making Scents: The Art and Passion of Fragrance®. Blending flora, fashion and science, this interactive exhibit will transform your space into a museum for the senses. Showcasing some of Mother Nature’s most fragrant botanicals, Making Scents offers a unique, innovative experience where visitors can discover the plants and flowers behind some of the world’s most iconic perfumes. Take visitors on a full sensory journey and explore the mysterious power of the sense of smell while learning about the unique artistry and science behind the fragrance industry. Now booking for spring 2019 and beyond. Thought-provoking, entertaining and educational interactive displays are set inside a Victorian-era ramshackle home, where visitors travel from room to room and learn about various poisonous plants that may be lurking in their homes and backyards. History, medicine, science, legend and lore are brought together to present a compendium of bloodcurdling botany that will entertain, alarm and enlighten. Now booking fall 2020 and beyond. Ready to book or need more information about one of The North Carolina Arboretum's traveling exhibits? Please contact Ashlee Lanier at ajlanier@ncarboretum.org or 828-665-2492 x. 220.